IMPORTANT: A growing num­ber of in­depen­dent "guides" in Si­cily offer ex­cur­sions (driv­ing you from place to place). Un­fortunate­ly, most of those found on the inter­net are not li­censed as tour guides, tour oper­ators or taxi driv­ers. This means that they probab­ly lack ac­cident in­surance that covers a client who (for ex­ample) in­curs an in­jury while walk­ing from the guide's parked car to an archeo­logi­cal site, such as the temples at Agri­gento and Se­gesta. Worse yet, some of these "guides" may de­ceive you into believ­ing that they are li­censed when they are not. In Italian law, on­ly a proper­ly li­censed com­pany qual­i­fies for the in­sur­ance de­scribed. In Italy the tour­ism/trav­el in­dustry is high­ly reg­u­lat­ed for your pro­tec­tion. 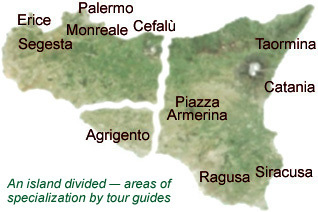 Most of the "guides" who offer walking tours for a tip or a minimal hourly fee lack legal permission to lecture at historical sites (Segesta, Agrigento, Siracusa, Monreale Abbey, Palatine Chapel). Sicily Concierge offers real travel services from real travel agents based in Sicily. Start dreaming, and visit Sicily Concierge. Castles in the clouds are just the beginning. See Sicily with your own Sicilian guide! Personalised tours, shore excursions and unique itineraries for small groups, including yours. Other articles presenting information and resources useful to travel agents are linked from the Travel Agent Page. Jackie Alio (aliojacqueline@yahoo.com) has worked in this field for over a decade. A leading historian, she has authored three books on Sicilian history and written articles for this site. Jackie has worked with, among other media, The Discovery Channel, and lectured university classes. In addition to her exceptional insights into the histories of the Fatimids and Normans in Sicily, her knowledge of Palermo's Jewish history reflects the kind of arcane scholarly (original) research that fosters an exceptional expertise. Jackie specializes in personalized tours as well as tours for larger groups. Visit her Palermo tour site for more information. Francesca Lombardo (lofran07@libero.it), a native of Palermo, has worked in tourism for over twenty years, and has been a licenced guide for most of that time. At university she majored in foreign languages and literature, with a concentration in art history. As a professional educator, Francesca brings a special talent to her profession as a guide. She speaks German and French as well as English. Francesca is the kind of guide familiar with all kinds of fascinating details, and a "go to" expert for highly specialized tours like "winemaking and the English families of Marsala." A certified sommelier, she wrote a book on Sicilian wine and cuisine. For more information, visit her site. Andrea Masi (masiandrea63@libero.it) is an archaeologist – the kind that excavates ancient sites, reports his findings at conferences, and organizes museum exhibits. British-educated, he is the only professional archaeologist in western Sicily who speaks English as his mother tongue, though he is very Sicilian (Andrea is Italian for Andrew), a background that makes his insightful perspective especially cosmopolitan. He specializes in the ancient Greek, Roman, Punic, Elymian and Sicanian archaeological sites of western and central Sicily. An archaeological excursion with Andrea Masi is a foray into a true understanding of Sicily's ancient civilisations. Visit his website for more information. Liliana Rainieri (liliana.rainieri@gmail.com), in addition to being a guide, was trained as a school teacher, something that brings a very special skill to her work. A tour with Liliana is truly a learning experience. The depth and breadth of Liliana's knowledge is remarkable, and as she explains the history of ancient Syracuse you sense that Plato and Archimedes were people she actually knew. It's almost as if they had come back to life and were speaking to you themselves. Joan Sheridan (joansheridan@touringmalta.com) has many years of experience as a licenced guide on the Maltese islands which, like Sicily, boast a multicultural heritage necessitating a guide's highly-refined knowledge of peoples, cultures and faiths. • Whether you find the name of a guide on this list or another, determine which languages the guide speaks. If you actually speak to him/her you'll be able to get some idea about fluency in your language. The guides listed on this page all speak foreign languages well; sometimes the advantage of native ("mother-tongue") speakers is that, being from (for example), the United States or Japan, they better understand the culture, interests and "touring style" of foreigners (non-Italians) visiting Italy. • Try, either via email correspondence or a telephone conversation, to get a feel for what there is to see; there are plenty of ideas on this site. A good tour guide will try to determine what you (or your tour group) want to see and do. For example, if your Sicilian visit has a culinary theme you'll want to see the street markets of Palermo or Catania. • Inquire about rates and the guide's availability on a certain day. It's important that you feel comfortable with the guide you hire. If you get a guide's name from this page, mention that you found it on Best of Sicily. • Do not confuse this page with those popular travel sites that list private tour guides around the world and include a section for Palermo, Segesta, Siracusa, etc. Displaying photographs of each guide, those sites bill you in advance for a "deposit" which is actually their commission (usually 20 percent or more) and then claim to put you in "direct" contact with the guide when, in fact, all correspondence is through the site. On this page you are provided "real" contact information via the guide's own email address. There is no "middle man" (commercial intermediary). • Guides are, by nature, specialists in a particular aspect of travel. If you require lodging, transportation or itinerary planning, the right service is a competent travel agent, tour operator or "travel concierge" with staff based at your destination. A tour guide may be able to arrange a walking tour of Palermo, for example, but visiting Monreale (outside the city) requires transportation, either by car or bus. Discuss these logistics with the guide. • Here in Italy, people are too often inclined to rely almost exclusively on paper "credentials" rather than actual quality of service, and some travel professionals use "certifications" as a substitute for listening to, and then meeting, your needs as a traveler. Scheduling, for example, is important because your time in a certain destination may be limited and Sicily's historic and archeological sites have fickle open-hours, so concentrate on the practical elements of your visit. • Rates may vary based on factors such as the season, but (speaking very generally) the cost of a guide service is typically slightly over 100 euros for a half-day (4 hours) "walking tour," and slightly more than 200 euros for a full-day (7 hours), not including transportation, which could easily double this rate. As a point of reference, this is the minimum you should expect to pay. You should question the approach and pricing of websites that publish rates much higher or lower than those. The advantage of this page is that you can contact a guide directly instead of using an intermediary. Tipping is always welcome, but especially appropriate with a "larger" group of at least six adults. • Travel Agents: Some tour guides may occasionally require a non-refundable deposit of at least 30% from travel agents reserving shore excursions for cruise passengers because, unfortunately, last minute cancellations (or "no-shows") are becoming increasingly frequent. • Remember that even if the focus of your trip is primarily cultural and historical, you're coming to Sicily to have a good time. Enjoy your discovery of the world's most fascinating island! • BEWARE of "guides" who drive you around Sicily that are not actually licensed either as tour guides, taxi drivers or tour operators (this includes many who advertise heavily on travel-review sites). Very few of these "guides" have liability/accident insurance coverage for injuries that might occur between their parked vehicle and an archeological site you have to walk to, such as those at Agrigento and Segesta. • A few travel agents and tour operators, and dozens of "independent travelers," have told us that this page alone makes visiting Best of Sicily worthwhile. • The editors wish to acknowledge that this page was suggested by a travel agent's experience with tour guides in Italy. He brought to our attention the vast differences between great guides and mediocre ones.